The millenium Biltmore Hotel brought a smile to my face as we entered the lobby, the interior of the gold and blue hued hall illuminated by the chandelier hanging from the ceiling brings your attention to the main galleria which were hand painted in 1922 by Italian artist Giovanni Smeraldi, known for his work in the Vatican and the White House. 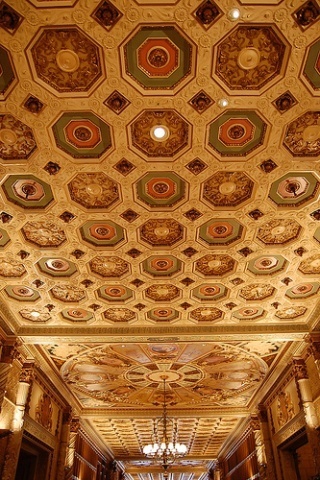 The Biltmore is known for once being a home to the Oscars. Eight Oscar ceremonies were held in the Biltmore Bowl during the Academy’s early years of 1931, 1935-39, and 1941-42. With pictures of the ceremony adorning the walls you can’t help but wonder who has stayed in your room. Having settled in, it was time to set out and explore the streets of downtown LA. Downtown LA is not known for its hustle and bustle of other huge cities especially on weekends and after dark once all the business men have gone home but what’s lacking in people is definitely not lacking in culture, and it has that with a capital C. First we walked through the Jewelry district that boasts the second largest Jewelry District in the world with over 5,000 wholesale and retail jewelry shops unfortunately this area is home to a large number of homeless people, further on is LA’s Broadway. 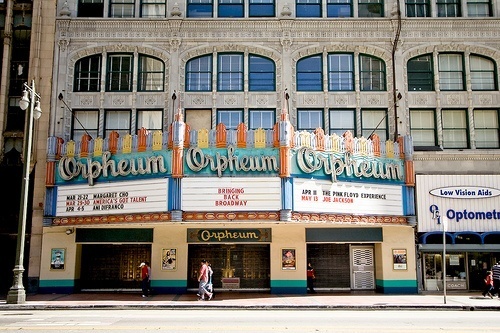 Broadway was LA’s entertainment hub until the 1920’s when it was eclipsed by Hollywood, back then the streets of downtown Los Angeles were awash in neon thanks to a confluence of movie theaters the world had never seen before. Dozens of theaters screened Hollywood’s latest fare, played host to star-studded premieres and were filled nightly with thousands of moviegoers. In those days, before World War II, downtown L.A. was the movie capital of the world. Stretching for six blocks the district includes 12 movie theatres built between 1910 and 1931. By 1931, the district had the highest concentration of cinemas in the world, with seating capacity for more than 15,000 patrons. 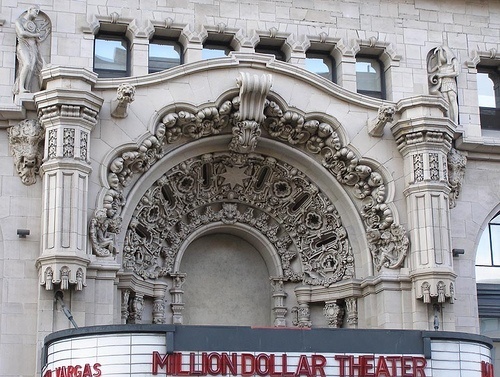 The Million dollar theatre screened Ben Hur for six months in 1925, the Los Angeles theatre opened in 1931 for the premiere of Charlie Chaplin’s City lights. 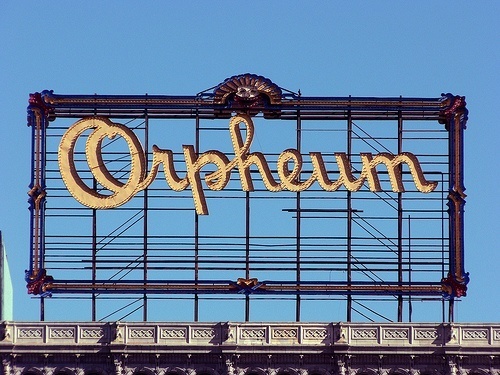 The Orpheum Theatre opened in 1926 and is still being used for American Idol and So you think you can dance.The Orpheum theatre is the only remaining theatre used to show movies, most of the other theatres are now churches. Hungry, and needing a rest, we started walking towards LA Live, which city planners had hoped would put downtown LA onto the map as a must go destination. The area got its first jolt when the Staples center opened, home to the Los Angeles Lakers, Clippers and Kings as well as a place for musicians to perform their concerts. 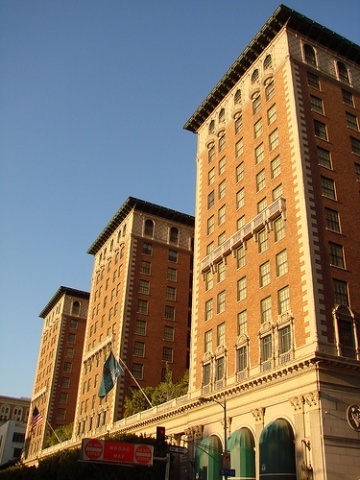 The Ritz Carlton and the Marriott have also opened in the same hotel tower. Nokia theatre with 7100 seats which hosts award shows and other spectacles is here as well as the ESPN recording studios and ESPN Zone, a sports bar restaurant and the Grammy museum are also located here. Finding a place to eat was easy as we chose the first place we saw RockNfish, a seafood, steak restaurant with its reddish, brick interior and pink sofa’s with matching pink napkins it offered a warm, intimate place to eat, the freshly seared mahi tuna came out perfectly with garlic mashed potato and coleslaw from the side orders, the beer battered fish and fries were also nice. Time to explore some more this time we had quite a walk all the way back past our hotel to some architectural masterpieces ,the nearest one to our hotel was the Richard Riordan Central Library designed by Bertram Goodhue in 1922 in Quasi Egyptian style that was very popular at that time as some of the old theatres were also designed in this manner. 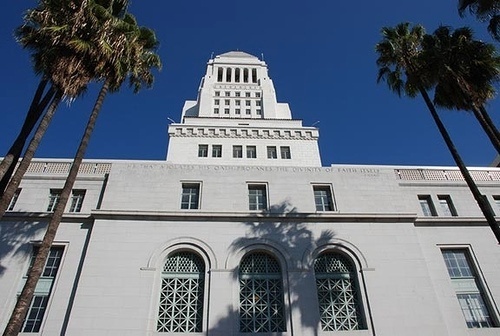 With 6 million volumes it is one of the largest public library systems in the world. The undisputed centerpiece along Grand Avenue is the sparkling Walt Disney concert hall. 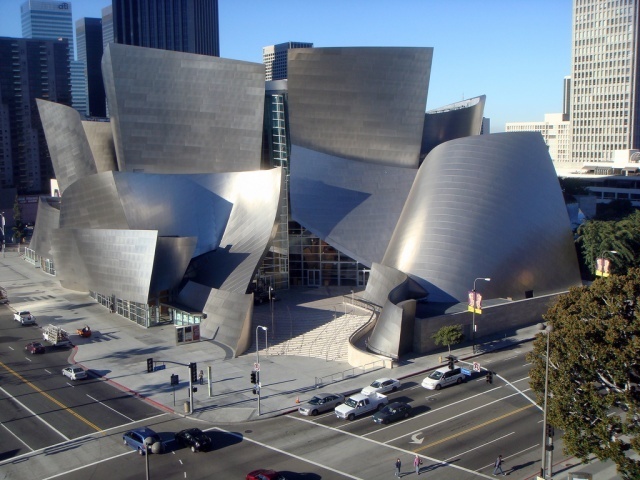 It is home to the Los Angeles Philharmonic orchestra and has the capacity to seat 2,265 people. Lillian Disney made an initial gift in 1987 to build a performance venue as a gift to the people of Los Angeles and a tribute to Walt Disney’s devotion to the arts and the city. The Frank Gehry designed building opened in 2003. The Concert hall is a curving stainless steel walled building that reflects the sun in the day, meanwhile the auditorium feels like the insides of a finely crafted instrument. 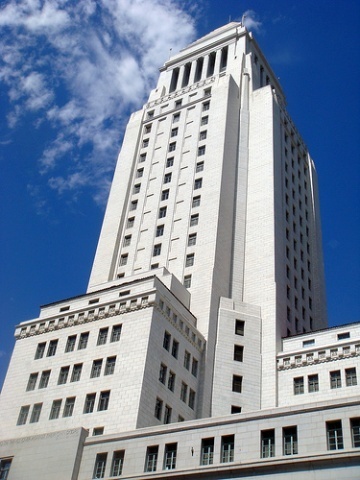 The last place to see for today was the Los Angeles City Hall designed by John Parkinson, John C.Austin, and Albert C Martin,Sr and was completed in 1928. It has 32 floors and, at 454 feet (138 m) high, is the tallest base isolated structure in the world, that will allow the building to sustain minimal damage and remain functional after a magnitude 8.2 earthquake. The Cathedral of our Lady of the Angels is also worth checking out for its architecture but we are not at all religious so we did not venture there. As I l lay in bed I couldn’t help but think of who had spent time in this room and what downtown LA would have been like in the early 20’s. When you think of windmills visions of the old wooden style windmills in the Netherlands are the first things that come to your mind but this is not the only place that you can see so many windmills in the one area. 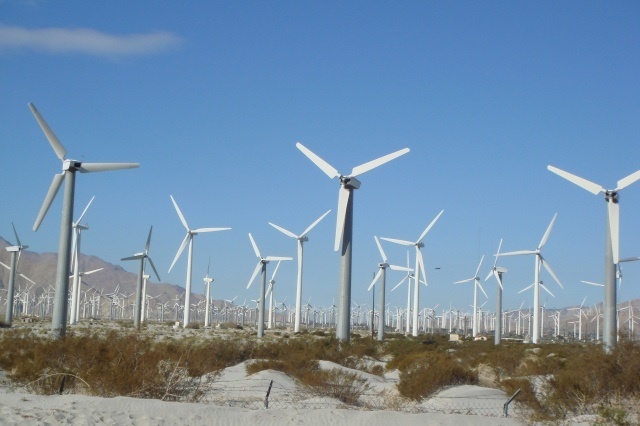 In Palm Springs, a city approximately two hours south of Los Angeles you are able to see many windmills along Interstate 10 as you near the city. It comes as a surprise when you first see these large steel turbines propelling in a circular motion. 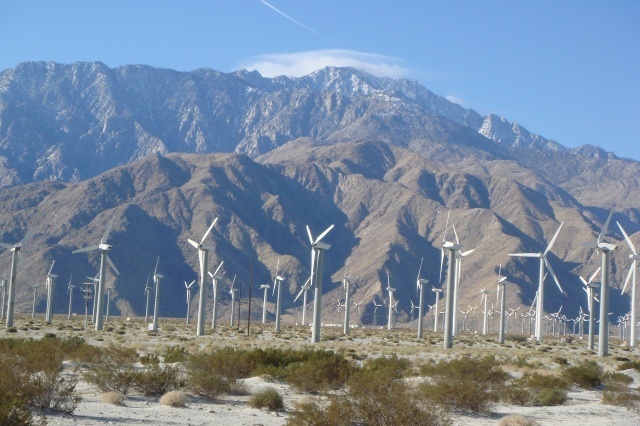 These windmills farms generate enough electricity to power the entire city of Palm Springs and the surrounding area. The farm produces 600-900 megawatts of power. 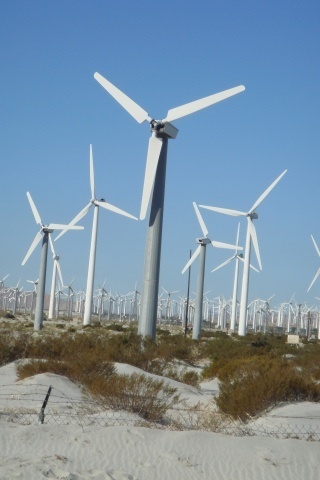 Utility companies buy the electricity produced by the 3,100 windmills at the wind farm. The farm runs many different types and styles of windmills. The largest windmills on the property produce enough power for 2,000 homes. The newest windmills are much more efficient than older models. 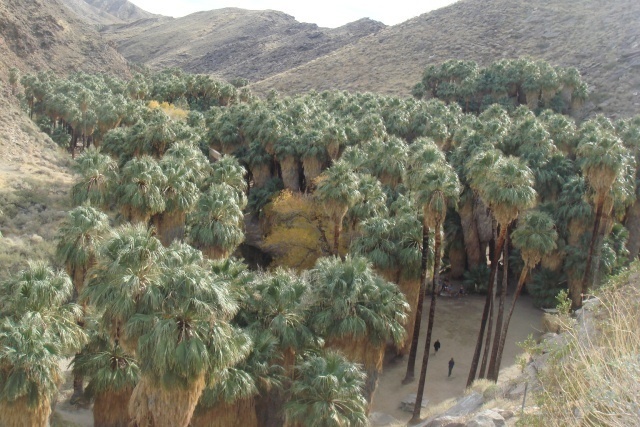 The Palm Springs area is unique, as the wind blows hard enough to power the windmills 300 days a year. 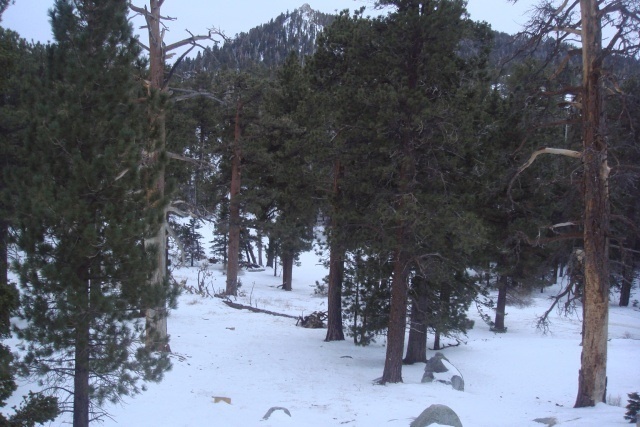 The San Jacinto mountains are the 3rd highest mountain range in California and provide a wind tunnel through the San Gorgonio Pass along Interstate 10. The wind runs east to west along the pacific plate. The winds usually blow west to east in the mornings and east to west in the afternoon so half of the windmills face east and half west to take advantage of this. Windmills are placed 700 feet apart for optimal use of the wind. As the wind goes through one windmill it becomes dirty and takes about 700 feet before it clears up enough to be used by the next windmill. If you see a windmill turbines not turning, it does not mean that its broken as i found out that the windmill has reached its maximum capacity. 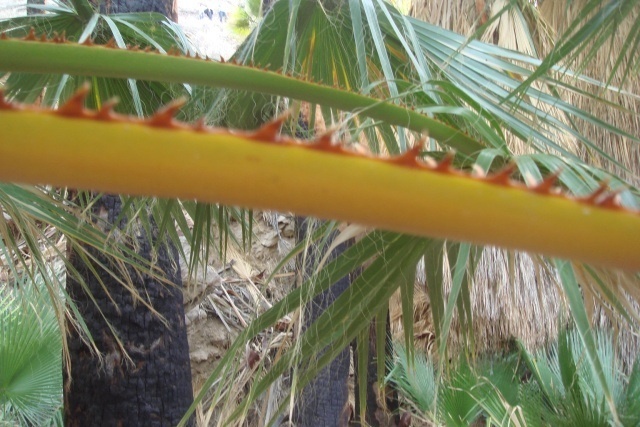 It’s great to see a city like Palm Springs leading other cities to become greener and improve our environment. 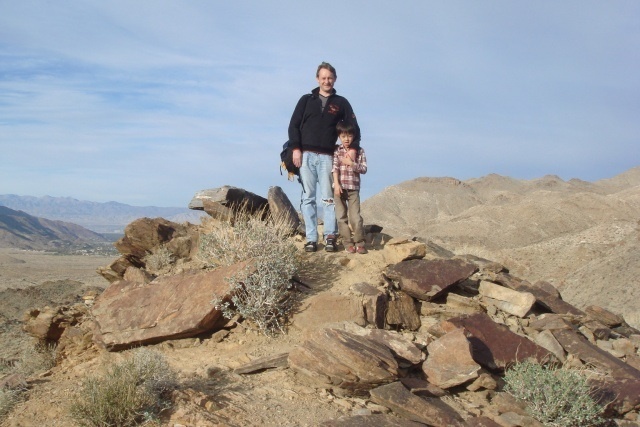 To learn more about the windmills tours to a windmill farm can be easily found from Palm Springs. 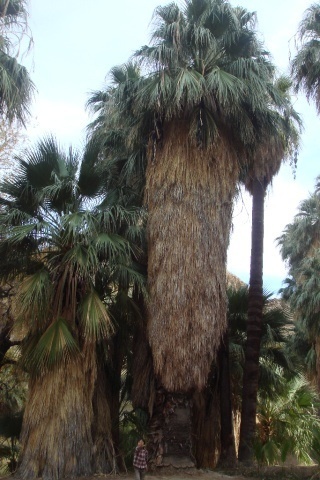 Have you seen the windmills in Palm Springs? Are there other places that have many windmills other than the Netherlands. 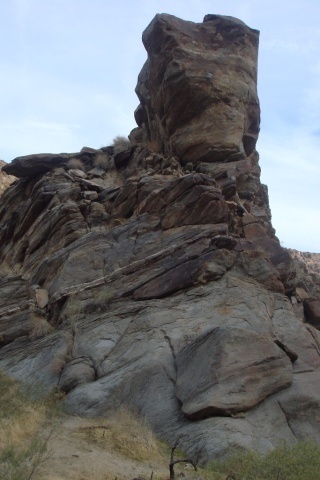 Hiking the Indian Canyons,near Palm Springs. The desert, an arid, dry, rocky land that expands across the horizon as far as the eye can see stretches across the Southern part of California surrounding the city of Palm Springs where the rather unknown Indians Canyons are formed which we only discovered due to the jeep tours for our family out to the more famous Joshua Tree National Park costing over $500. 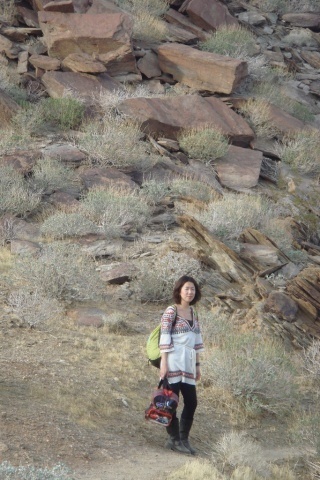 The Indian Canyons would only cost us the taxi ride out and another $20 in entrance fees,this time there would be no jeep and the exploring would have to be done on foot. 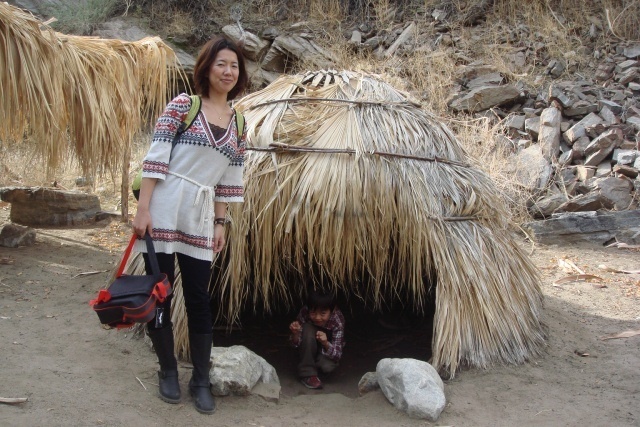 The Cahuilla, native Americans roamed the canyons for hundreds of years on the southwest edge of the Coachella Valley. 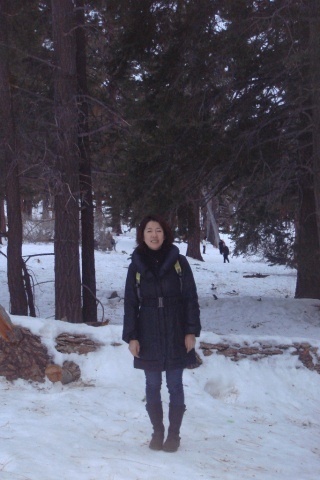 It was perfect for them, hunting was made easy when the prey would come down for a drink by the streams flowing from the San Jacinto mountains. 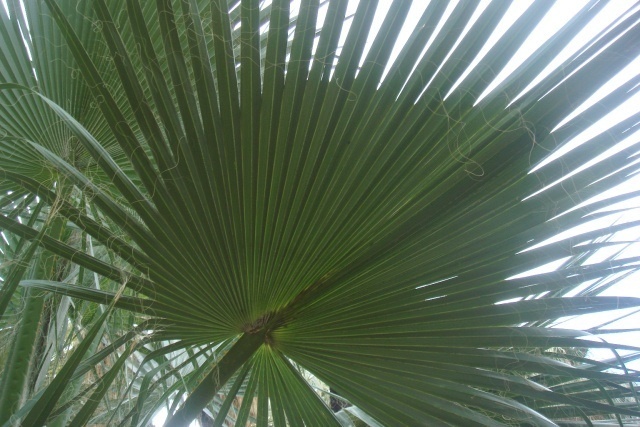 Oasis were formed with pockets of green fan palm trees, where native Americans made their homes. Food and water was in abundance. In 1876 the Federal government divided the valley into a checkerboard. 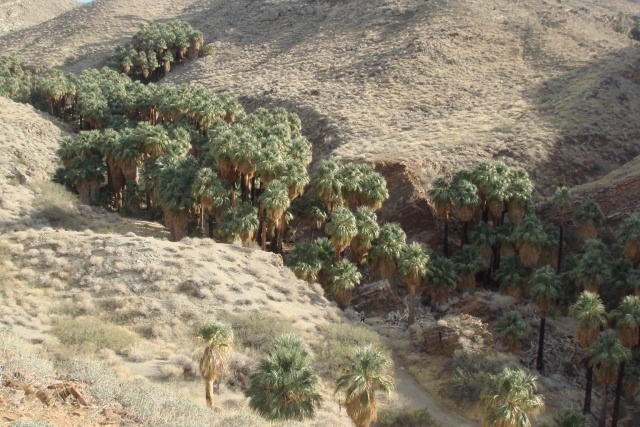 The Southern Pacific railway received odd numbered sections, while the even numbered sections were given to the Agua Caliente as their reservation. 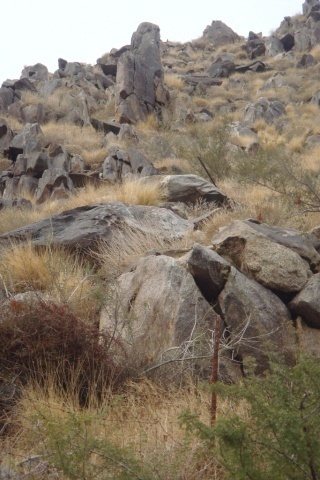 But boundaries were not established until 1940`s and by then much of the native american land had been built on. What is amazing about the canyons are the contrasts in landscape from the rocky arid dry land with rocky cliffs and various cactai growing, to the canyon floor where there is a lush green oasis with fan palm trees and stream flowing along with thorny plants, here by the water you see a variety of birds flying around, a nice spot for the avid bird watcher. 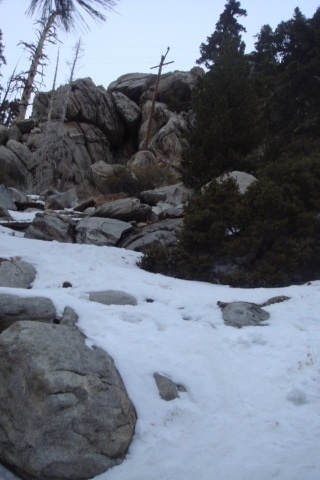 The rocky cliffs are home to the big horn sheep and if you arrive early you can see the tracks that the animals have left when they have come down for a drink overnight. 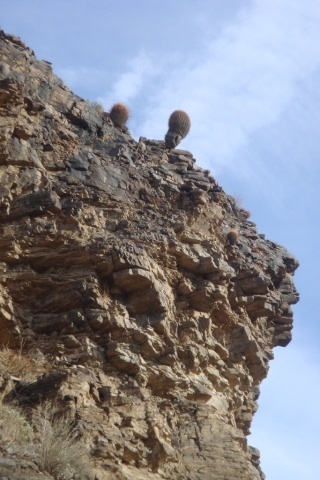 Hawks and other birds of prey soared overhead as we made the climb up the highest section of the hike. 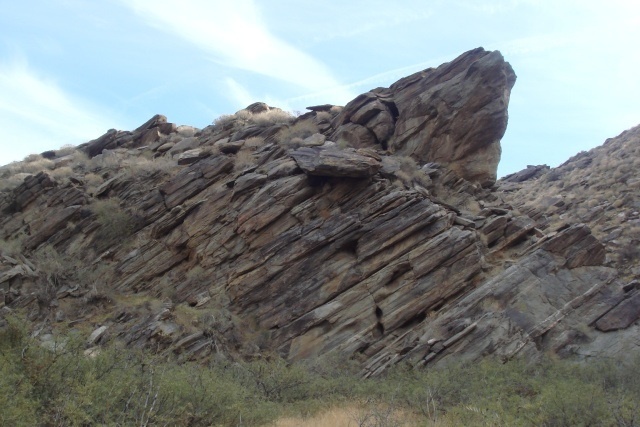 There are various hiking trails for the public to enjoy, the more well known trails are the Murray Canyon,Andreas Canyon and the 15 mile Palm Canyons trail. 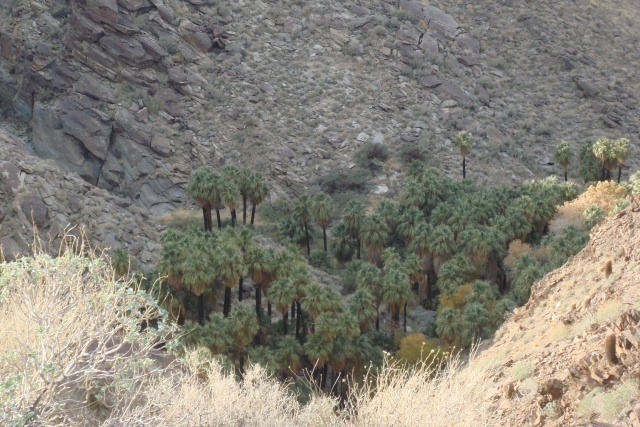 We hlked along the Palm Canyon trail for about 2 miles, then switched to another trail that led up through the rocky cliffs offering you a chance to be exposed to both environments. 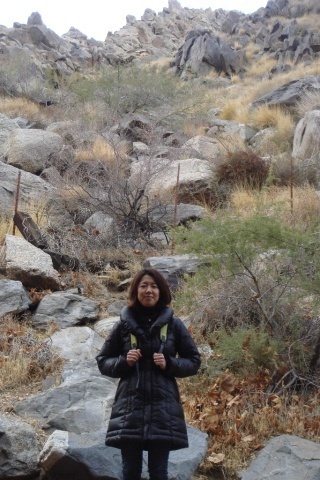 The hike also led to the highest point of the cliff with splendid views of the Oasis floor down below and overlooking the city of Palm Springs. The track up through the cliffs loops back to the start of the trail where we witnessed three beautiful hummingbirds having a feed. 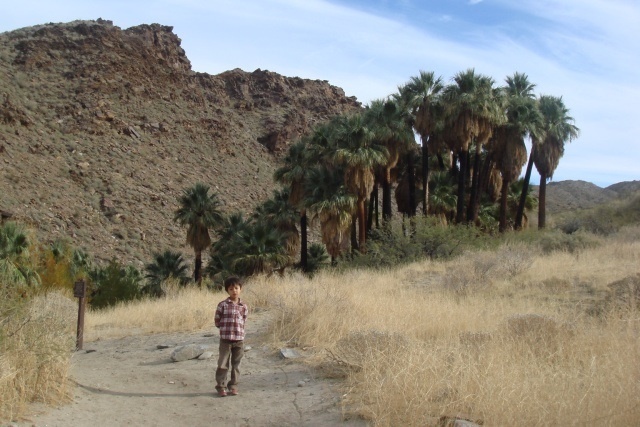 If its too costly for you to take a day tour to Joshua Tree National Park then the Indian Canyons make a fine alternative but don’t forget to bring your hiking shoes as jeeps don’t take you around this park. 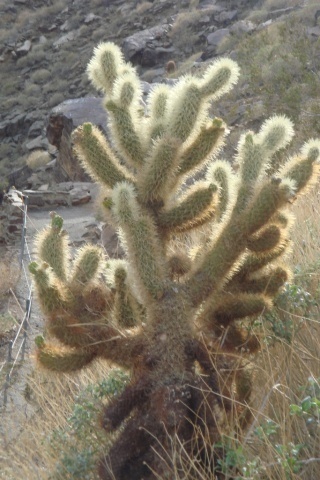 Have you been to the Indian canyons near Palm Springs? We would love to hear what you thought of them. 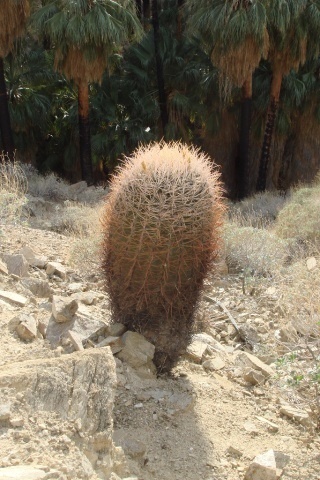 Palm Springs, the home to the Rat Pack in the 50’s and 60’s when they left Hollywood to party hard in the desert. Once the rat pack left, the retirees swarmed in to take over the golf courses, until the mid 90’s when a new generation fell in love with the laid back little city. Palm springs is definitely an oasis of the desert with its boutique hotels, steel and glass bungalows and piano bars serving the perfect martini. Palm Springs lies in the middle of the Coachella Valley, surrounded by desert and land owned by the Cahullia native americans which allows people to gamble the day/night away in the casinos, but there is so much more to this city of 46,000 people than to just bathe in the sun by the pool and gamble. 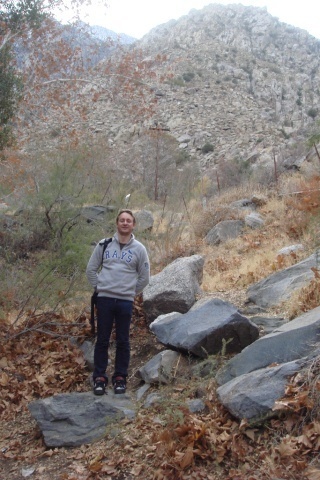 We were here to explore the outdoor attractions that Palm springs has to offer. 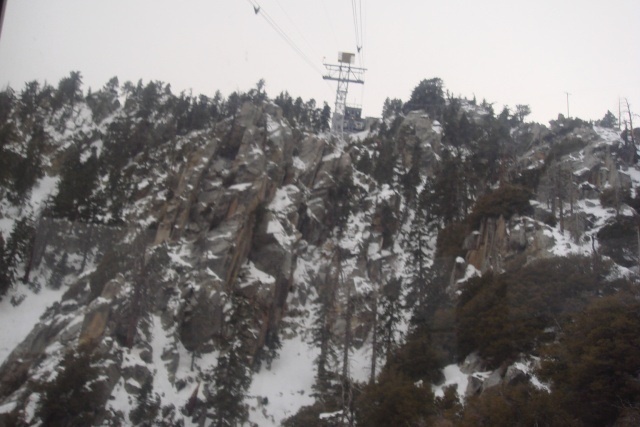 One of the must things to do is to zoom up the mountain to the Mount San Jacinto National Park, where you travel in the revolving aerial tramway. 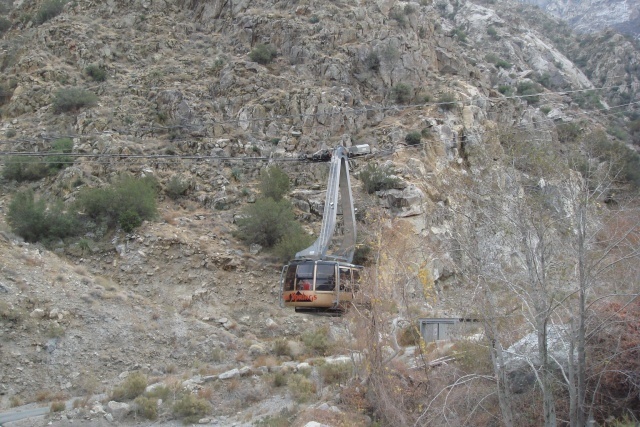 The largest of its kind transporting up to 80 people at a time, transporting them from the valley station at an elevation of 2,643 feet passing through 5 unique life zones to the mountain station at 8,516 feet. 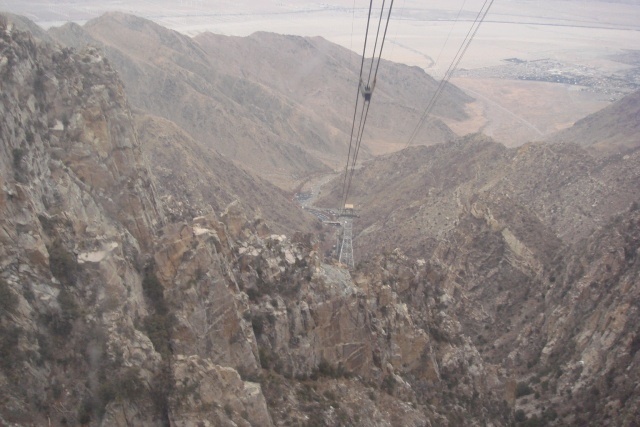 The 2 and a half mile trip takes only 10 minutes, rotating twice to give everyone the opportunity of seeing the entire valley. They say its like taking a trip from Mexico to Alaska in just minutes,with it being 30-40 degrees Farenheit cooler you can see why. 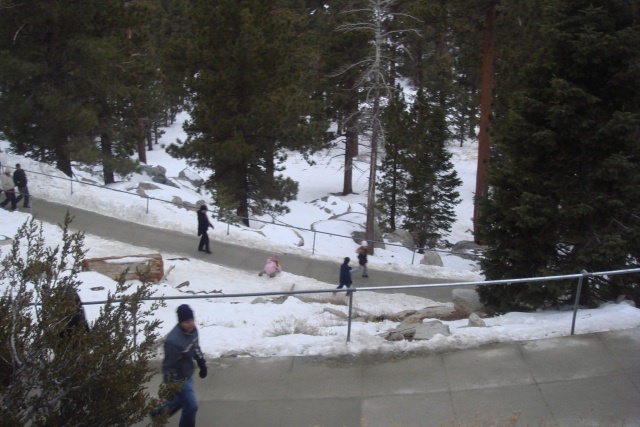 It had been a warm day down below, but now with it being rather cold, snow lay on the ground for people to play amongst the pine forest. 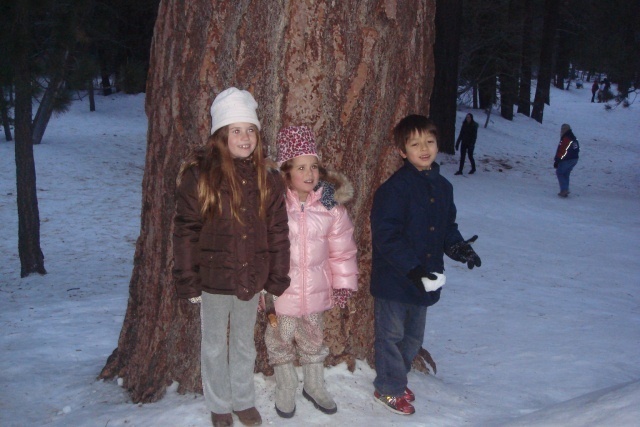 Making snowmen, sliding on their toboggans and people doing some cross country skiing or snow shoeing. 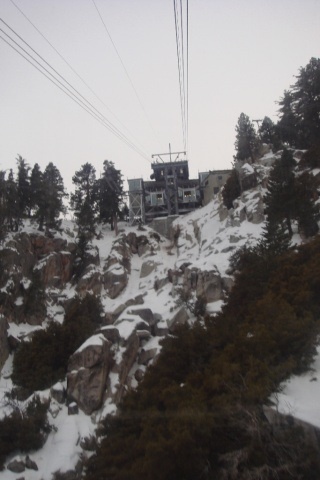 It was a fun day up top to be had by everyone. 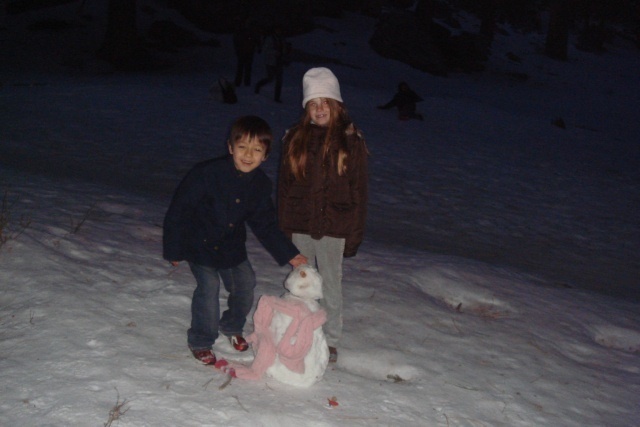 My son had never experienced so much snow on the ground, as it melts straight away in Osaka, had one of the best days of his life. 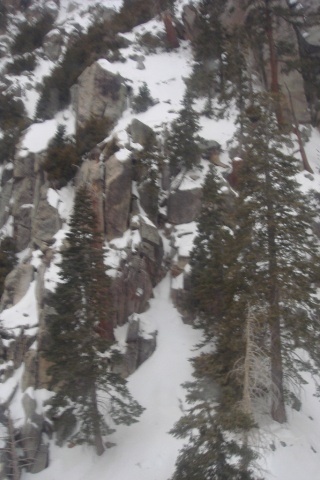 The snow, one of the few places you can surf, swim and ski all within 2 hours, it’s California. The closure of National Parks and Monuments in America. Travelling to America takes a lot of time, money and effort for some it may be a once in a lifetime opportunity for them to explore some of the 388 National parks that are located in America. It is estimated that 275 million people from America and around the world visit America’s national parks each year. 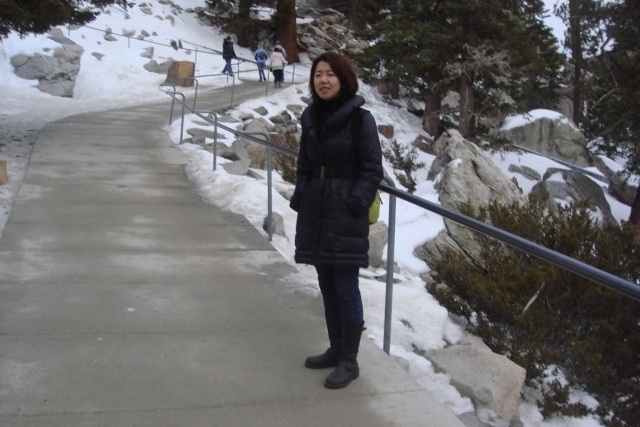 The National Parks offer amazing vistas of rivers,lakes, waterfalls, canyons and mountains, that can be viewed at the likes of the Grand Canyon, Yosemite National Park which are must visits for any tourist to America. Unfortunately though from October 1st these parks have been forced to close to the public. It’s just not the National Parks though it is also the National Monuments, who has been to New York, one of the first things you want to see is the Statue of Liberty. In San Francisco you want to go to Alcatraz and then in Washington DC, a city filled with monuments and the world-class Smithsonian museums. I’m sorry these are also off-limits to the public too. How did this all happen and without much warning. I’m not American so I know little about their politics and it seems complicated as I’m observing this from abroad. It all seems to stem from the House of Representatives (Lower House of Congress) has refused to pass what is known as the “Continuing Resolution” to authorize the US government to spend money into the new fiscal year that runs from October 1st, 2013 to September 30th, 2014. The government now has no legal authorization to spend money, federal employees , federal contracts and bills cannot be paid by the Treasury Department. Therefore everyone has been sent home and everything closed. Federal police, the military, air traffic controllers and the like are to report for work, but there is no money authorized to pay them or any other federal employees. Andy Lisowski, an employee of the Library of Congress (The National Library of the USA) in Washington DC has been affected personally while on a vacation in Spain he tuned into BBC to follow the closure of the US Government. He was expected to return to work on Tuesday but no one knows when the government will reopen or when paychecks will resume. He is forced to be on furlough along with thousands of others. 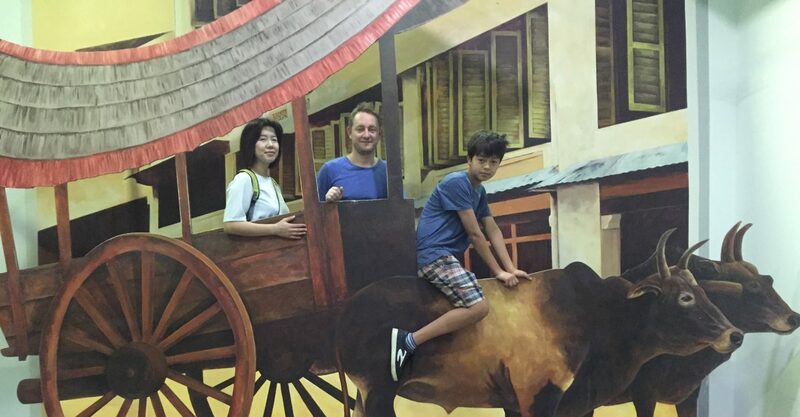 Nicholas, a tourist from England is worried what he will do. He has been to 12 cities in the US and had planned to visit Death Valley, Grand Canyon, Bryce, Zion National Park as well as Canyon Lands. “The cities were great but these parks would have been the cherry on the top”. He has a booked flight, non refundable and leaves from Chicago on the 25th. It is just not tourists or workers for the government that have been affected what about all those little towns and villages that rely heavily on the tourists who come to the National park . The towns that people stay at, buy food and groceries for their time in the park. These too will be affected,in 1995 and 1996 the last time the government forced the closing of the National parks, these towns lost around 14 million dollars a day in revenue, the prediction now is around 30 million a day. I’m guessing these towns are wanting things to change and to change fast. I’ve heard that people have suggested to others to go to the parks any way, ignore the signs, the barricades and enter the parks. 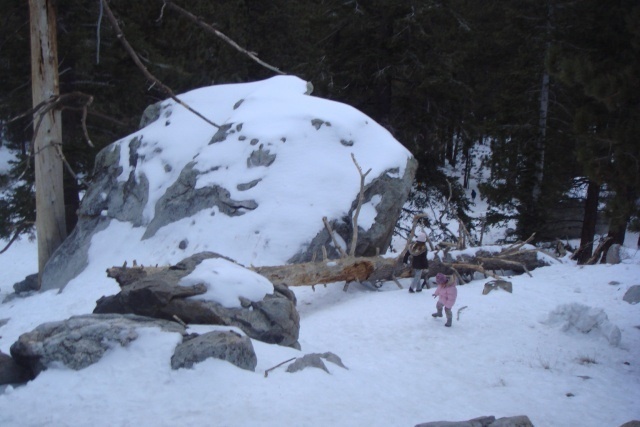 You may be able to do that but there is no parking, lodging, camping or food available. The trails in these parks too are sometimes very far from these entrances that would also make it near impossible to gain access. You could also be escorted out of the park or even arrested for trespassing as security has not been furloughed. Each day this painstakingly affects more people, draining money from the still struggling economy. 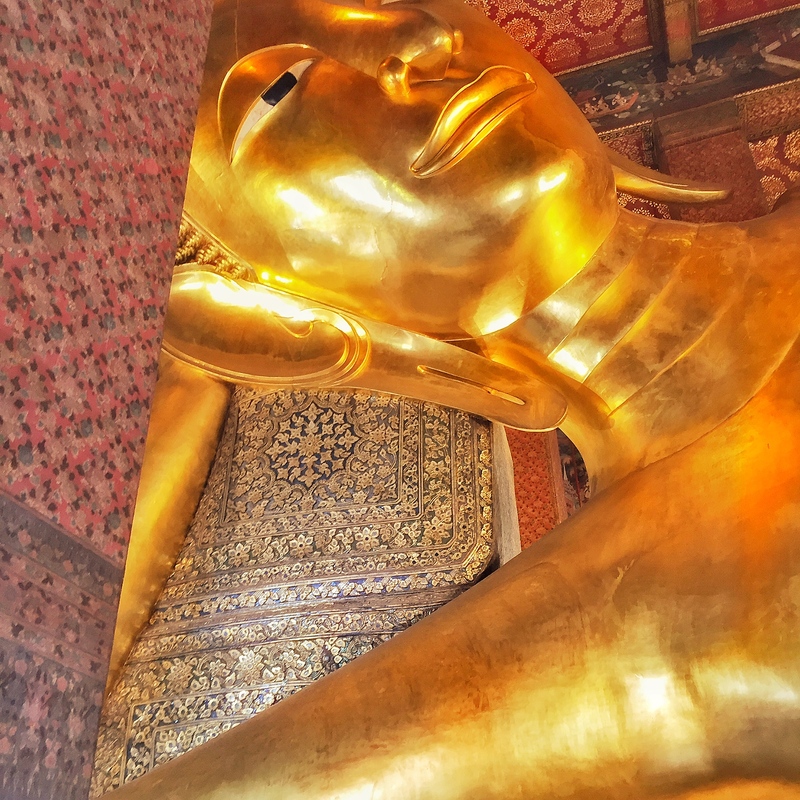 This will come to an end but for how much longer do tourists, workers and the American citizens need to suffer for something they have had no control over. Has your holiday or life been affected by what has been happening in America. We would love to hear about it, so don’t be afraid to leave a comment. Hollywood is synonymous with the rich and famous, the king of film and television has gone through a lot since the glitz and glamour of its hey day. 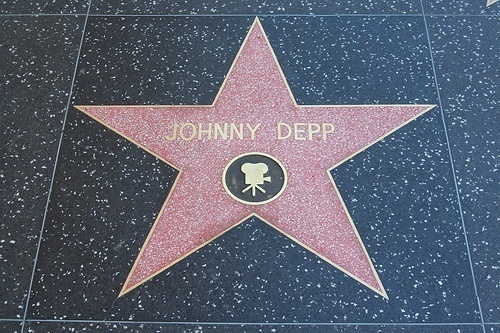 You may no longer be able to see anyone remotely famous except perhaps at a movie premiere, the night of the Academy awards or someone being presented a star on the walk of fame . That shouldn’t stop you from spending a day with the family in Hollywood. 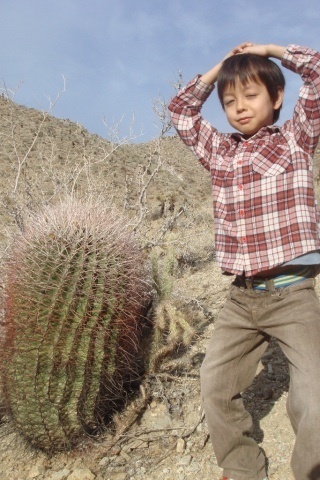 Children and parents as well, will love the kitsch of the city of dreams.